Limo Bus vs. Party Bus: Are They Different? If you have decided to party in style with your friends or family, you will need a vehicle that best fits your needs, while providing you with all the necessary amenities, safety and nevertheless a stylish way to get around. Some of the limo buses and party buses are better for a night out, while some are better for a wedding service or airport shuttle. Either way, choosing the right one for your party is highly important, as it can make the difference between a party to remember, or just a plain story to tell your friends. As surprising as it may sound, the terms limo bus and party bus refer to a large motor vehicle, usually derived from a conventional bus or coach, which is modified and designed to carry anywhere from 10 people to 40-50 people. These vehicles are used for recreational purposes and have tons of advantages for a party group. No matter the name, these vehicles share the same characteristic: a bus exterior and a limo interior. The entertainment factor with a limo bus is unbeatable by any other way of transportation! 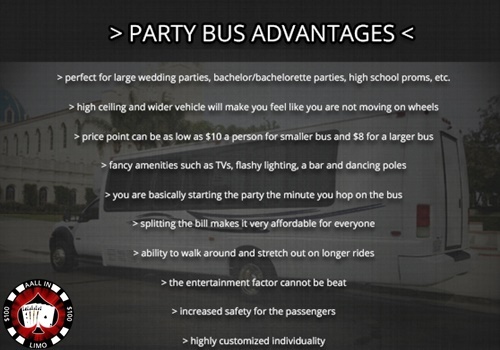 Here are some of the advantages of hiring a party bus for your event! Limo buses and party buses come in various sizes and have a highly customized individuality. There are 2 vehicle designs that we need to mention: the popular front-engine cab-chassis design and the rear-engine diesel-pusher. The front-engine cab-chassis design is maybe the most popular limo bus version, fitting around 20 to 30 people. It is often referred to as a minibus, and it is basically an oversized airport shuttle with a limousine interior. The minibus provides a rich array of features and it is designed to provide maximum comfort, fun, and safety, all on 4 wheels. If you have got a big party planned, the rear-engine diesel-pusher design is the way to go. Not only does it fit up to 50 people, but it also comes with VIP rooms, lots of space, hardwood floors and anything in between to make your event a total hit. It may look like a regular bus from the outside, but on the inside, it is anything but regular! Choose from Our Limos for Your Party! If you want to get loose and wild for your special event, the party bus is the way to go! Overall, party buses offer an atmosphere that will definitely make everybody at your party feel like a VIP and with common sense and learning to control alcohol consumption, passengers can experience an unforgettable ride. Call us at 858.336.1894 and book your party limo now!